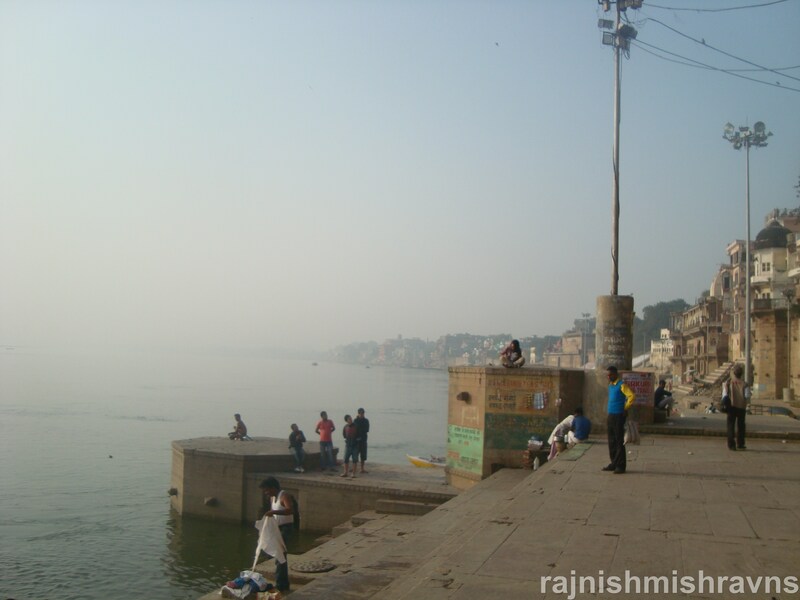 Banaras is a city whose name is recognized all over India, and some other parts of the world. People have their pre-formed ideas about the city before they have even reached it or seen it, and their prejudiced view of it before they have understood its patterns. It’s a text and a text is not just on page or screen; it’s also in minds – as the orally transmitted content. That’s how, we are told, the vedas or shrutis were handed over from one generation to the next. With the rise in the popularity and due to its affordability, the transfer of knowledge through shruti did not remain viable. The printed text replaced the oral one in a big way: but not entirely. The oral text remained active and popular and it wasn’t given the name of shruti anymore. It became a collective version of the psyche of individuals: of all its parts. Edward Said popularized the concept of “imaginative geography and history” and Benedict Anderson that of the “imagined communities”. 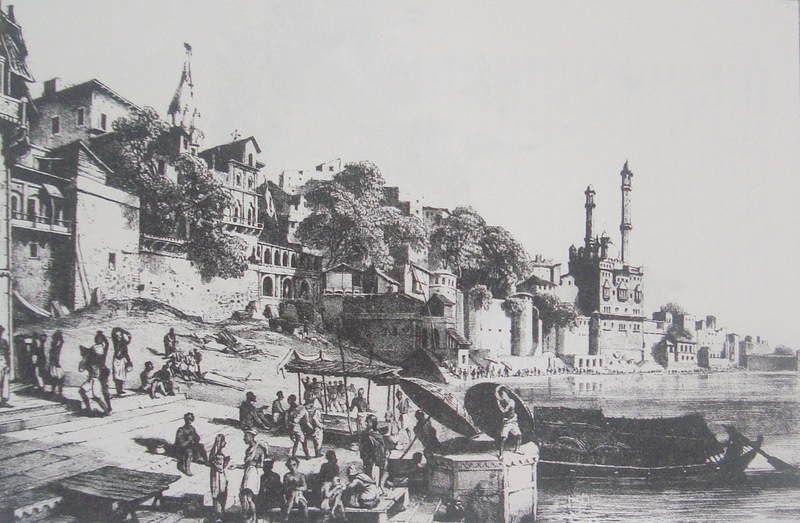 Here, in this blog, the idea of an “imagined topography” of Banaras was put forward. The history of the term “imagined topography” being usede in this sense is not older than a couple of days but the history of the idea that the term denotes is much older than that of the concepts put forward by Said and Anderson. In relation to the imagined topography of Banaras, there’s also the idea of Banaras. Long before the idea of the modern nations had come into existence and much long before the Orient came into its textual existence, there was the idea of Kashi and Kashi as an idea. My Translation of the Hindi form: The umbrella shaped light that spreads over the water, that doesn’t get submerged with the earth after deluge, what’s that? Vishnu said: O Sages! In the beginning, when I had contemplated upon Mahadev in his lingam form for the welfare of the universe, then he came out of my heart in his lingam form. He then expanded and became the panchkroshi Kashi. My Translation of the Hindi form: The grand avimukta Kashi for the expanse of five kroshas must be known as the Jyotirlinga form of Vishweshwar. Light, say the sages in Kashi Rahasya, spreads over the water and then they speak of its submergence with the earth like a tangible thing. Vishnu speaks of his contemplating the lingam, i.e. an idea, and that idea comes out of his heart to expand into something concrete and material: Kashi. The boundaries between abstract and concrete don’t exist when the idea of the city comes to the fore. Rather, it is the ideal form of the city that takes precedence over the material one, both literally and temporally. The seed that grew into the city that its lord loves so much is its lord Mahadev himself. In Kashi Khanda the city is being seen as one with the lingam, or vice versa. Kashi of the shlokas above emerges more as an idea than a corporeal city, and it has continued doing so, in the minds of the millions of Hindus who come to this place of pilgrimage. The various accounts of the city, both by the Indian and the foreigners, emphasize various facets of the city and its life. The foreigners who came to India and Banaras were Muslims in the beginning. Those from the West came later. The western eyes have observed the city and recorded their observations for nearly half a millenium now. Ralph Fitch and Peter Mundy had come to the city in sixteenth and seventeenth centuries respectively. They had very little to write of it. Bernier, who had come there in the second half of the sixteenth century, writes mostly of the religion and the ideas of the philosophers that he had met in Benares. Most of his time in the city, it seems, was spent in meeting the philosophers and theologists of the city because he wanted to understand the way the people of India, and of its religious capital thought, so that he could pronounce the Western systems of ideas superior with certainty. Bernier’s contemporary Tavernier gave a very detailed account of a temple and its services, along with an account of a school. None of these early travellers gives space to the city and life in the city. Jean Baptiste Tavernier had come to Benares in 1665. His account of the city is special because he had been to Bindu Madhav Temple at Panchganga Ghat just a couple of years before Aurangzebe had ordered its destruction and the construction of a mosque that bears his name even today: the Alamgiri Mosque, or, as it’s known more popularly, Beni Madho’s Dharhara. The Dharhara commands a very dominant position in the ghatscape of Banaras and can be seen from a ghat as distant as Raja Ghat. It has attracted painters and photographers of Banaras. It has also been shown in most of the films that show the city. Tavernier calls the “pagoda of Benares” the most famous temple of the country, after the Jagannath Temple in Puri. He then writes of the recesses on the side of the steps leading to Gangaji and about the sanctity of Gangajal. Around four centuries ago, his mind did protest at the claim made about the purity of the river’s water by the Hindus. The reason he gives behind the pollution of water is the Hindu practice of throwing corpses (of certain categories of humans and of animals) into the river. His concern has been echoed through the years that followed his, by the people who came to the city after him. Tavernier describes the altar in the garbh griha and the idol. He mentions that women were not allowed to enter the temple, so they used to have the darshan from the outside. On the right side of the altar he had seen the figure of Garud that was made of gold. His description of the temple services and of the devotees and their activities is detailed and covers the minutest of details. He also describes the school that Raja Jai Singh had established nearby. 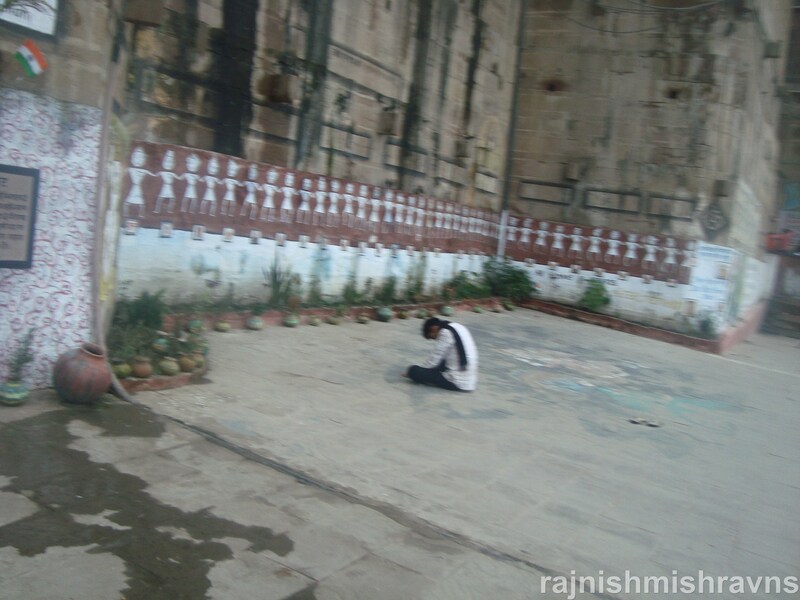 He went to the temple in the same building the next day and observed and recorded the early morning activities around him. In Rajkumar Santoshi’s Ghatak (1996) the camera focusses on the city of Banaras at 13:57 minutes from the beginning and leaves the city for Mumbai at 23:34 minutes. Sunny Deol comes out of the river and rings a brand new brass bell while walking towards a temple – a temple that isn’t and a Nandi and Shivling probably made of plaster of Paris on that very day – a temple created for the film. A sparkling bell is shown dangling from the lintel of the arch way over the opening to the ghat. In Banaras, bells don’t dangle above the steps of ghats, they have their place which is inside the temple and the entrance to a ghat is not the entrance to a temple. Ghatak is an action film. So, the hero is a wrestler and his name (guess what!) is Kashi. His father, a respectable elder of the muhalla, is shown meeting people around Assi Ghat. He is well known among the people of the locality, i.e. he lives around somewhere, or, at least not very far from there. Later on, just before they leave the city, they are shown on the roof of their house, and from the ghatscape behind, one can make out that their house is near Harishchandra Ghat, as is clear from the palace on Chet Singh Ghat visible in the background in the image above. Thus the hero is shown at picutresque and characteristic locations of the city, while the film keeps suggesting that its the way life is lived in the city. Thus, the film not only creates an imagined topography but also supports the propagation of an imagined culture of the city. The biggest scam using Varanasi’s name and a couple of images was Sangharsh (1968). The title rolls on while the camera caresses the majestic ghatscape of Banaras (and a flooded Gangaji). The film is based on “Mrs. Mahashweta Devi’s” Bangla novel Layli Asmaner Ayna. There’s a caption as the last of the credits are given: “Banaras: the Nineteenth Century”. The very opening scene shows a temple that troubled me for a really long time. I could not locate it in my city. Neither could I remember having seen the stone of the dark hue of that temple being used in construction in my city. It was later, while doing some research on this post, that I found out that the temple is in Maharashtra and the film was never shot in Banaras. There’s not a single scene of the film actually shot in the city. That, while the story is set in Banaras! The film takes exploitation of the audience’s “willing suspension of disbelief ” to the next level. Raj Kapoor’s Ram Teri Ganga Maili shows the heroine’s entry in Banaras as a composite of shots showing the ghatscape, Varanasi Cantt. Railway Station and the streets of the city, without showing any of the characters in a frame with the city’s locations, i.e. the snapshots of the city were inserted in the film without any actual shooting in the city. That’s why the film’s story set in the city is shot mostly indoors. No attempt has been made to mask the artificiality of the set and the windows in the Madam’s house in Banaras, the place where the heroine is trained for her future profession, open on to the painted screens of the studios. The only other clippings of the city show, very obviously, Baba Vishwanath‘s temple where a character goes to worship the Lord of Kashi. Otherwise, this film, like Sangharsh presents Banaras only in name, as if the director was forced to do so because it was mentioned in the script. The Chiranjeevi’s Telugu superhit Indra the Tiger (2002) was dubbed in Hindi too and I saw that version. The action shifts to Banaras in the beginning of the film as the hero moves to the city. The introduction to the city is same as that in the other films, i.e. the picturesque of the city has been highlighted. The majestic ghatscape of the city is shown in a series of screen shots, both in day and night times. Moreover, keeping the popularity of the city as a centre of pilgrimage in South India in view, various characters viz. the heroine’s family are shown coming to the city because of its religious significance. The audience is introduced to the city at the ninth minute from the beginning of the film. The pasting of the ramdom picuresque together to form a collage city and the exploitation of the general audience’s ignorance of the topography mark this film too, like the others discussed in the post. The hero comes out of the river and the camera focusses alternately on him and on the (supposed) garbhagriha of Baba Vishwanth’s Temple. 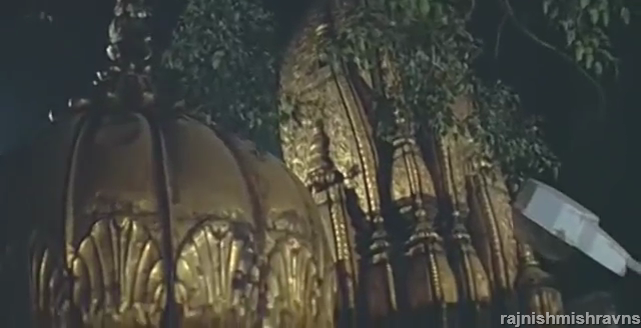 It’s very clear, like in Ghatak, that the temple isn’t real. There’s a gap of around two decades between Satyajit Ray’s Aparajito and Joi Baba Felunath (JBF). JBF is a detective story and is spun around an adventurous tale of Roy’s creation with the detective Feluda, his writer friend Jatayu and his apprentice Topshe. The film is set in Banaras and it does not imitate the way Ray had presented and treated the city in his previous film. JBF could have been set in any other city without losing any of the audience’s interest. Banaras is merely ornamental in film, just incidental, for the structure of the film. Its ghats, majestic buildings, the river and boats, the grand subahe banaras etc. are in no way essential to the plot’ s development. Banaras is the ornament around the characters and action in the film, much unlike Aparajito in which the city was one of the central characters, without which the first forty minutes of the film will be unimaginable as Banaras is the soul of that part. That’s not the case in JBF. The important scenes with the city as the backdrop do not actually need the locations where they are shot. 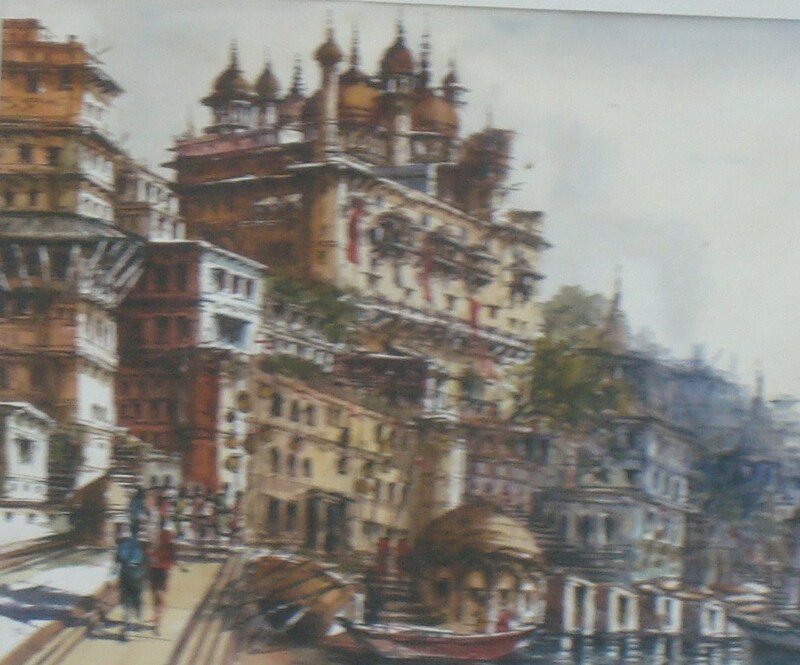 In fact, through the insertion of the various picturesque and characteristic places of Banaras Ray created an imagined topography of the city. He may also have done so because of the appeal of the city for himself and the other Bengalis: his target audience. Macchli Baba could have met his followers under a shady tree in a garden instead of Rana Mahal Ghat, and Feluda could have observed Maganlal meeting the Baba somewhere else too. The protagonist et.al. could have waited at any place other than Gyaan Vaapi for Maganlal’s goon and could have declared his commitment to avenge his friend’s harassment at any place other than Kedar Ghat. The same holds for Feluda’s confronting Bikash at Ram Bhandar and taking him to Man Mandir Observatory. It would take between fifteen to twenty minutes for a person to walk from Ram Bhandar to Man Mandir Ghat. Feluda could have gone to another ghat, e.g. Sankatha Ghat where he could have reached within five minutes. But no, the observatory had to be shown, so it had to be inserted into the film. The one place where imagined topography can never be challenged is the dream songs and sequences of Hindi films. Therefore, it’s justified when Raanjhanaa takes the picturesque and the commonplace from Banaras (and Ramnagar) and pastes them on screen as a collage in the song “Raanjhanaa main tera“. The images in the gallery below have been taken from the same song and they are from Ramnagar, Manikarnika Ghat, Godowlia and Assi. There are smooth shifts from one place to another, thus creating a kind of Banaras that isn’t there. It can never be. The same may not be so justified when used upon the locale to depict the place where action is taking place in the film, as it creates a pseudo-city that has never been there, or, in Baudrillardian terms a simulacrum of Banaras. Resisting the impulse to generalize it for films per se, it’s being asserted here that in Raanjhanaa a disjuncture is visible in the setting of the scenes or frames from one scene to the other, and specially within songs. The disjuncture becomes conspicuous at many places, e.g. Zoya’s father teaches at one of the universities of Banaras. Shankar takes Bindiya there to break Zoya’s engagement with a doctor. Their scooter is shown reaching the University gate, that does not look like any of the entrances to BHU, but in the very next frame they are shown entering a building over whose wall Banaras Hindu university is painted. Another instance of imagined topography (that a non-Banarsi will not be able to suspect anything about) is Zoya’s father and some other Muslims coming out of the Dharhara Mosque at Panchganga Ghat. He lives at or around Assi according to the storyline. 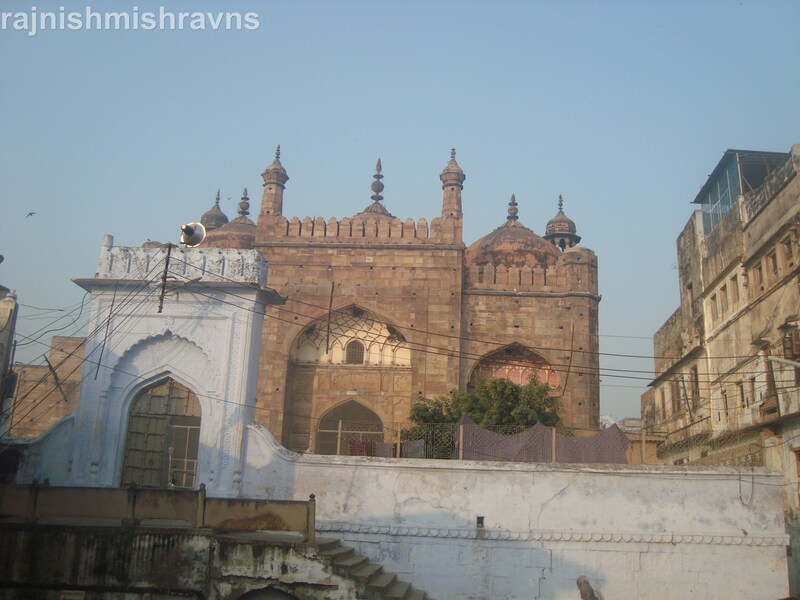 The Dharhara Mosque is deep within the galis of the pakki mahal. Google map shows that the distance between Assi Ghat and Panchganga Ghat is around four kilometres and the time taken to cover the distance is eleven minutes. Now, that may be true in any other place, and in Banaras between eleven at night to five in the morning, when a mad man rides a motorbike. It’s impossible to cover the same distance in any predictable time period under the light of the sun because of the high population and vehicle density of the zone. So, a person taking so much pains to reach a mosque so far away from his home, that too, when the mosque is not the central mosque of the city, is very far fetched. I feel the pull of the comparison and contrast method, as I have Aparajito with me but that would be tantamount to blasphemy. Any film critic worth his salt will acknowledge that but the audience, that invests money and time in watching the whole film will not hesitate in doing so. Why? Because it was his time that he spent/invested/wasted on a film. Therefore, although I liked both the films and prefer them to all the other films with Banaras in them, I found that watching Aparajito had beenmore rewarding and its part shot in Banaras natural, free and worthy of repeated watching. The same can’t be said about the other film. The first frame of Raanjhanaa (2013) shows the protagonist at a hospital in New Delhi. He starts narrating his story and his story takes the audience to his his place and his city: the Assi muhalla in Kashi. The film presents the city very lovingly as it is a part of the protagonist Shankar’s identity. The picturesque is highlighted and in the process an imagined topography is put into place through the process of collage making. It’s not unique, the collage making, to this film. Actually Raanjhanaa is a part of the long tradition of Hindi films that create their own topography on screen. In the beginning, the little Shankar is shown collecting donation for Raavan Dahan with his gang. They reach Zoya’s house and take a hundred rupees from her father. Children going around for such purpose, and on foot, normally cover their neighbourhood only, otherwise they risk challenging some other person’s hegemony over their area. Shankar had declared very proudly that he belonged to Assi. So Zoya’s house ought to be within the maximum radius of five to seven hundred metres, taking Assi Ghat as the centre of the circle. Zoya and her father are shown flying kites from her roof top. The snap of the scene given above reveals her house’s location. The camera covers and arc of nearly 180 degrees while they fly kites. The arc includes multi-storeyed buildings and the kind of construction that helps us place it somewhere along the street joining Sankatmochan to Banaras Hindu University which is beyond the radius mentioned above. Shankar is shown at and around Assi ghat regularly with the objective to establish his identity and to fix his locus in the film. So, according to the script of the film, the boy and the girl live at or around Assi. The girl asks the boy, after slapping him fifteen times, to meet her across the river at the King’s Palace in Ram Nagar. The palace is beautiful and provides a wonderful opportunity for the cameraman to linger over the river beyond the palace. The long shots with the river filling the whole frame appear again and again in the film at important junctures, e.g. the two friends discussing at roof when Bindiya reaches there, and then that scene in which the protagonist is shown lying on the parapet of his roof. In both the scenes mentioned above the frame is beautified by Gangaji behind. The picturesque in Banaras acts like an addiction to those behind the lens – be it a photographer or a cameraman. How can they resist the its charm, even when the cost to be paid is imposing the picturesque upon the plot. The chase sequence (that ends with Shankar’s tearing the shirt of Bindiya’s father on Holi as he had pledged to do that in his childhood) in the galis of Kashi withshots taken from the rooftops captures the roofscape and the galis very well. My blog, as far as I know about it, has never presented the filthy face of the city. It has acknowledged a couple of times that my city is filthy, but has then always drawn the attention away from the fact by presenting something more interesting the very next moment. It has been largely unconscious: the process of my subscribing to the stream of “Banaras is beautiful ” discourse. Now, I confess and bring my cards out to the realm of consciousness. Yes, I have been contributing, in my own manner to the “Banaras is beautiful” stream and will continue doing so. The gallery above is another endorsement of the stream I keep contributing to. There’s one more reason for my not putting the filthy Banaras on display: when it comes to clicking, I tend to gravitate towards the picturesque and away from the filthy. hence I don’t have much filth to show. That being established, I can proceed to my account of my city’s filth and my reaction to it. I have always hated filth from as long back as I can remember. I used to hate drizzles as the below saturation amount of rainwater reaching the surface of the galis and streets would then make a thick colloidal solution kind of thing with dust, dirt, garbage, cowdung etc. That solution did not feel good on the skin of my feet protected only by a chappal. I hated walking barefoot to Baba Vishwanath’s darshan not merely because the whole gali-street combination leading to the entrance of the famous Vishwanath Gali used to be dirsty. It was because the gali then entered and specially the stretch after Annapurna Temple gateway would be filled with grimy and sticky suspension and I used to hate that sensation on the soles of my feet. In Banaras, cow dung and dog’s poop are strewn liberally all over the walking surface of the galis (and streets). Banarsis who have personal problems with an exposure to that kind of material, i.e. the non-resistant Banarsis, acquire the habit of putting their steps forward very carefully. I am one of the non-resistant variety and even after my taking extra precaution my feet used to tread upon cow dung sometimes. Whenever that happened I used to search for the nearest source of water supply to wash my feet and slippers. The feeling of walking with the sticky dung makes me uneasy even today, as it not only affects the body but also the mind. It’s a kind of minor trauma for a NRB. [Note: Bull’s excreta is stickier and has the power to affect the victim up to at least the level of his soul]. Add to that the garbage thrown on to the galis where it stays for twenty-four hours minimum, and its subsequent removal for storage, as an intermediate yet long duration step, at some open front and roof storage space situated in densely populated parts of the city. I find it true, as far as my observation is concerned. It’s probably the process of socialization that introduces human beings to the hatred of filth. The concepts like nakedness or hatred of filth are acquired while growing up. The process is mostly unconscious on part of both the society and the individual. Moreover, there is a wide range in the tolerance of filth varying from one culture to another, and from individual to individual. The Banarsi culture, it seems, falls towards the comparative higher level of tolerance, albeit with individual variations. Or, probably, my essentialization is incorrect. I want to think audibly this evening. I do not want to make a speech and if you find me this evening speaking without reserve, pray, consider that you are only sharing the thoughts of a man who allows himself to think audibly, and if you think that I seem to transgress the limits that courtesy imposes upon me, pardon me for the liberty I may be taking. I visited the Vishwanath temple last evening, and as I was walking through those lanes, these were the thoughts that touched me. If a stranger dropped from above on to this great temple, and he had to consider what we as Hindus were, would he not be justified in condemning us? Is not this great temple a reflection of our own character? I speak feelingly, as a Hindu. Is it right that the lanes of our sacred temple should be as dirty as they are? If even our temples are not models of roominess and cleanliness, what can our self-government be? Shall our temples be abodes of holiness, cleanliness and peace as soon as the English have retired from India, either of their own pleasure or by compulsion, bag and baggage? Both the quotations above highlight the squalor in the city. I have talked to many people about my city and have read about it. It has been established in the popular domain of knowledge with certainty, after repeated exposure to similar ideas, that Banaras is one of the filthiest cities of the world (some even call it the filthiest one). The proof is presented in a very shocking manner (shocking to me at least) – by that filth disseminated in JPEG format over the internet, posted on page after page about my city. When I state that it may be said to be without drainage of any kind, that its subsoil is saturated to a depth of several feet with the filth and abominations of centuries, that every well in the city is contaminated by percolation from the offensive soil, and that in spite of all these evils it is a healthy city, one wonders how this can be…. The Benaras stinks are already gaining a world-wide celebrity, and ere long those of Cologne will be forgotten. These stinks only too plainly and emphatically tell us how much drainage is wanted in Benaras and there cannot be much doubt that if this city is not very thoroughly drained and improved, as much as sanitary science will allow, an outbreak of some epidemic like the plague will devastate the city, and cause heavy loss to Government [Fitzjames 1880:9]. 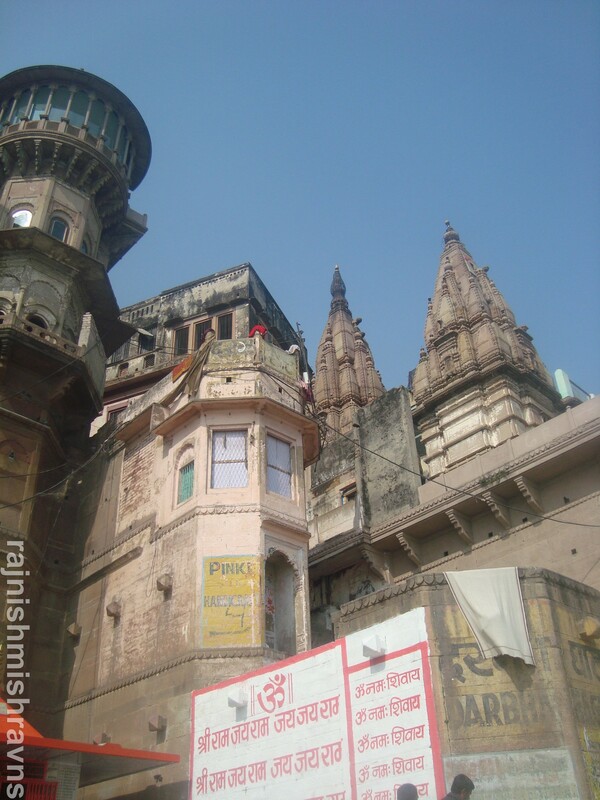 To realize the filthy state of Benaras is quite beyond the power of anyone who has not visited it. The subsoil, when opened out, gives out a most sickening offensive stench. [Fitzjames 1880:11]. Fitzjames designed a sewage program to combat this kind of filth. The Mahatma was speaking about Varanasi in the beginning of the twentieth century and Twain and Fitzjames were writing about it at the end of the nineteenth century. To these texts when the various documentaries etc. about the city are added the resultant is a huge corpus of texts on the city, which is a part of the whole discourse on Varanasi. Filth has coexisted with the picturesque for as far as the available texts describing the city holistically are concerned. Gangaji and the ghats for the core of what is called picturesque in the city. They also are the sites where the filth of the city has been directed to from the time habitation begun in the city [tall claim: with at least at present, nothing to substantiate it textually]. I have seen many films in Hindi, Bangla and Telugu (dubbed in Hindi) that have Banaras as the locale either for a part in the beginning or in parts spread throughout the length of the film. They choose to show only the picturesque and gloss over the filthy Banaras. By doing that those film put forth another Banaras. Thus they counter the “Banaras is filthy” stream of the discourse with “Banaras is beautiful” stream. These are classic shots of Varanasi ghatscape spliced from Hindi films Laga Chunri Mein Daag, Banaras: A Mystic Love Story, Sangharsh and Ghatak. Banaras is the place all the films are set in, and the audience is exposed to the picturesque in the city even before he is introduced to any action or to the characters of the film. Aparajito, Joy Baba Felunath, Laga Chunri Mein Daag, Ghatak, Banaras: A Mystic Love Story and Raanjhanaa show the city for a considerable period of time. They choose to show only the picturesque and simply gloss over the filth and the filthy. By doing this, these films stand directly against those texts and documentaried that show the filth and judge the city as it really is.